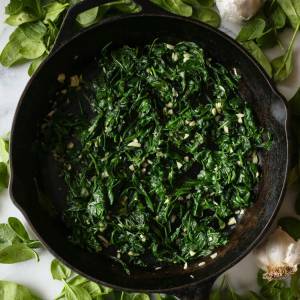 This Sautéed Garlic Spinach is a quick, versatile side dish is a great way to use up that spinach in your fridge! Serve it immediately or make it ahead for meal prep bowls or omelets. In a large skillet, heat the olive oil over medium heat. When hot, add the spinach and most of the garlic (save about 1 tablespoon of garlic to add near the end. Also, you might need to add about half the spinach and allow it to wilt a little before adding the rest.) When the spinach has cooked to where it’s about at the top of the pan, add the remaining garlic and cook, stirring very frequently, until the spinach is almost completely cooked down and most of the liquid has evaporated. Season to taste with salt and pepper and vinegar or lemon juice. Serve immediately or save for meal prep bowls, omelets, etc. *You can actually use whatever fat you like here–because there are so few ingredients, you can mix up the flavors a lot by using different fats. If you have some bacon grease lying around, it’s very delicious here. Butter is also good. If you’re planning on making this ahead, I recommend using olive oil because it won’t congeal.